Japan has more than 100 million people, so it isn’t surprising that there’s someone like Mr. Hatoyama, but it should be very surprising that the DPJ would reappoint him to the position of Senior Advisor for Foreign Affairs for the party…This means either that Prime Minister Noda doesn’t think foreign affairs is part of the national interest, or doesn’t think the national interest is important. – Former Foreign Minister Komura Masahiko, now Vice-President of the Liberal Democratic Party, speaking on the reinstatement of former Prime Minister Hatoyama Yukio. 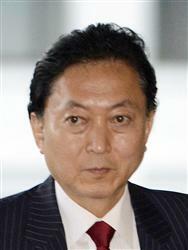 Democratic Party Secretary-General Koshi’ishi Azuma met former Prime Minister Hatoyama Yukio at a Tokyo restaurant to ask for his cooperation in stemming the tide of defections of DPJ Diet members. He also sounded out Mr. Hatoyama about restoring him to his former position as Supreme Advisor to the party, from which he was suspended after voting against the DPJ government’s tax increase legislation. THOUGH not yet in the center ring of Japanese politics, the dominance of political center stage by Osaka Mayor Hashimoto Toru ensures a stream of speculation by the media about whom he will jump under the political covers with. The more pertinent question is whom he will allow to jump under the political covers with him. 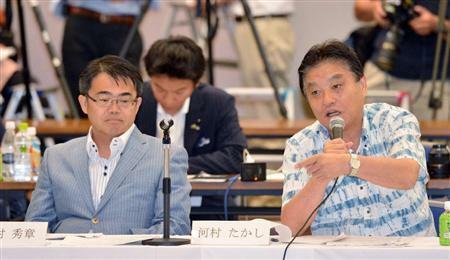 The Osaka mayor is unlikely to have anything to do politically with that losing dog, and in the event he does it will be on his terms, not those of Mr. Hatoyama. An even more unlikely partner is former Diet member Suzuki Muneo, but that didn’t stop the media from asking him. 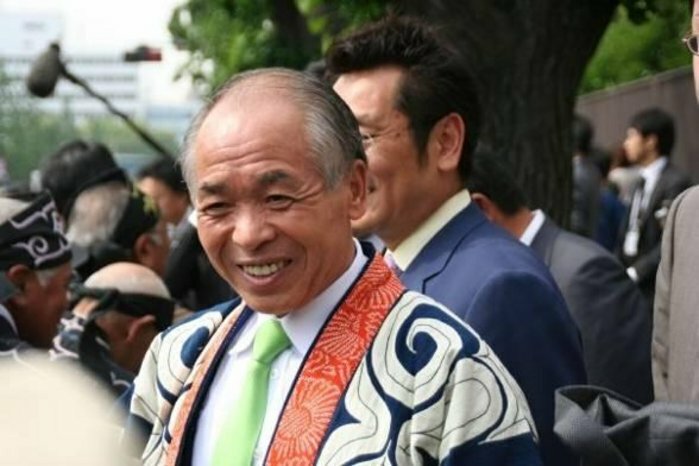 The reason Suzuki Muneo is no longer an MP is that he was found guilty of accepting ¥6 million in bribes from a construction company in Hokkaido while serving as chief of the Hokkaido Development Agency, and ¥5 million from a timber firm when he was Deputy Chief Cabinet Secretary. 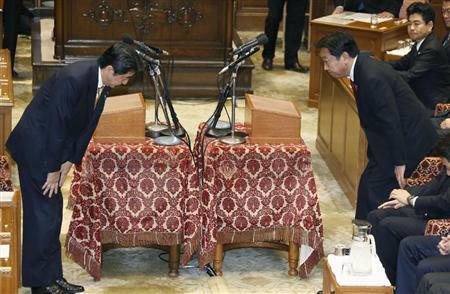 When last he had a Diet seat, he was allied with Mr. Hatoyama’s ruling DPJ. He was released from prison in December 2011. 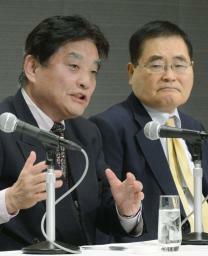 Mr. Suzuki still has a vanity party, however, and it has five Diet representatives as members. That’s the number required to receive the public subsidies given to political parties. Not so long ago, he called for the abolition of those subsidies, but changed his mind and accepted them in April. Because of his conviction, he is no longer eligible to hold public office. A more appropriate question is what an ex-con convicted of bribery while serving the public thinks he can accomplish as the head of his own political party. 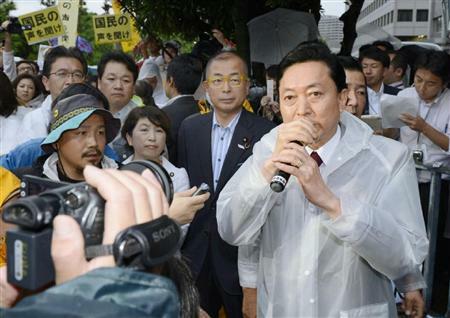 Hashimoto Toru knows that he will be fatally contaminated if he gets anywhere near that toxic waste of a politician. It’s morning, and with it comes the nonsensical battle in which the anti-anti-nuclear energy forces defend the crude tactics of the Sankei Shimbun’s editorial page, which is feverishly mocking the anti-nuclear energy forces, who are feverishly defending the idiot Sakamoto Ryuichi. So good morning and how are you today? THE lack of Japanese language ability is no impediment to understanding either the content or the tone of the disputatious uproar touched off by the Fukushima nuclear accident and Prime Minister Noda’s decision to restart the Oi plants in Fukui. That uproar, which has frothed over into large demonstrations in front of the Kantei, has the identical characteristics of what passes for political and social debate in the West. One side is inebriate of the righteous high fueled by vibratory emotionalism, and no fact, argument, or person is about to kill their buzz. Were it not for the absence of trashing, smashing, burning, violence, looting, defecating, sexual assault, and squatting on property both public and private — this is Japan, remember — the anti-nuclear power advocates are an analogue of their brothers and sisters of the Occupy movement. They share the aerated craniums and the solidarity of show business personalities and the radical leftists delighted to find a new outlet for their destructive impulses. The anti-anti-nuclear power advocates have their Western analogues as well. They alternate between the presentation of fact-based argument that points out the Fukushima cancer fears are absurd, and showers of ridicule and scorn when they realize that they too are only preaching to the converted. But the anti-anti-nuclear power forces stopped paying attention to him long ago. Shooting the intellectual equivalent of dead fish floating at the top of the barrel is much too easy to be any fun. By past mistakes, Mr. Hatoyama means his previous call to increase to 50% the amount of power produced by nuclear energy in Japan as a means to ameliorate “global warming”, with all the new plants to be built underground. 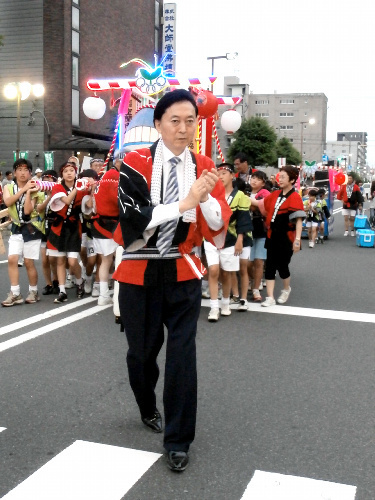 Copping a lick from the Gesture Politics songbook, he then entered the Kantei and declared he would deliver the protestors’ message to Prime Minister Noda himself, who was in Kyushu at the time. 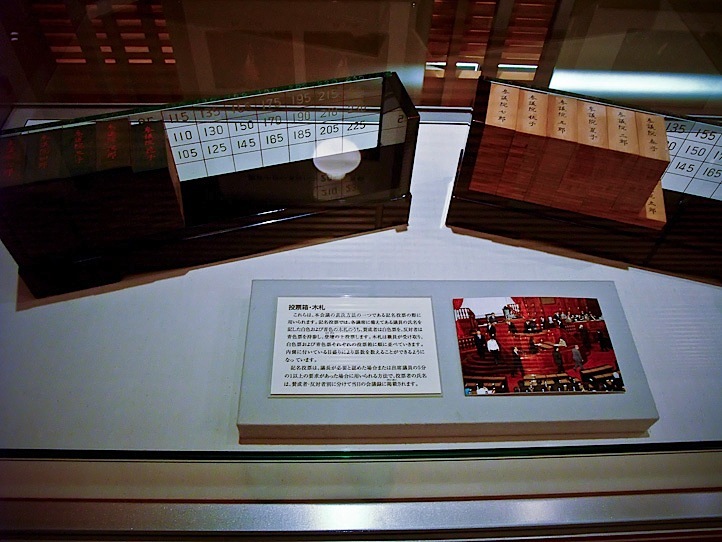 (The prime minister’s daily schedule is printed in the newspapers every morning.) 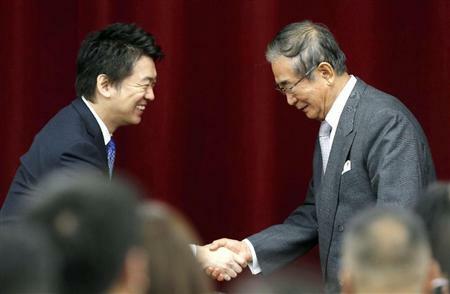 Chief Cabinet Secretary Fujimura Osamu had 15 minutes to spare for the man he once helped vote into office. That description would have worked just as well for Social Democratic Party head Fukushima Mizuho, had she not stayed in school, become an attorney, and defended those dropouts in court. She’s the Japanese version of the beady-eyed, punitive left who clad their intrinsic unpleasantness and in the boilerplate of high-minded idealism. You can see it in her face in the photo at the top, where she is standing to the left of Hatoyama Yukio. 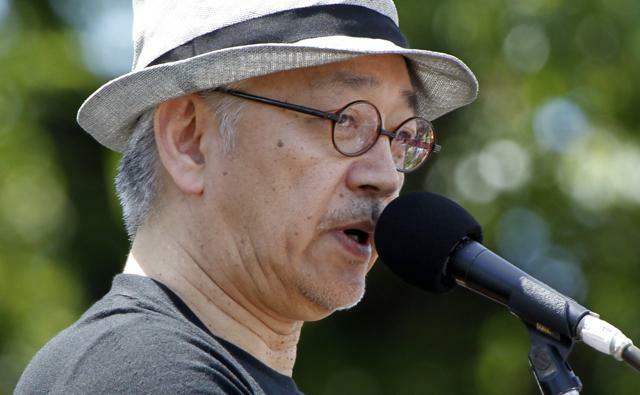 Kan Naoto also created a brief ripple earlier this week when he publicly addressed Prime Minister Noda: “You have become the object of the people’s anger. Do you even understand this?” That statement, which would be serviceable as the Kan political epitaph, was sloughed off after a brief snort. Everyone saw through the undead’s transparent attempt at self-resuscitation by trying to hang his legacy on his successor. Is that not a fitting requiem for the DPJ? Their first two prime ministers, the most unpopular national leaders in postwar history, think that soiling their successor is a purification ritual. “We should not place in danger the lives of children, who are the future of this beautiful Japan, for what is, after all, only electricity”. The quotation at the top of the page charges the Sankei Shimbun with crude tactics, but one of their ripostes was all the more devastating for its deftness. “As soon as you get off the airplane in any airport in the world, the distinctive culture of that country is revealed. People often mention soy sauce and miso for Japan, kimchee for South Korea, and curry for India. Perhaps that is a problem of preconceived images. “What do you think it is for the US? I think it is air conditioners. You can hear their rumble and smell them as soon as you reach the airport. I remember that well from the time I came to New York. I’ve gotten completely accustomed to both the sound and the smell. “Air conditioners were invented in the U.S. in the first part of the 20th century, and now they are an indispensable part of our lives. Perhaps it is because of the ”let it all hang out” attitude (おおらかさ) of Americans, but air conditioners in that country are noisy. No one asks that they be made quieter. All of this is to be expected by the mountebanks of the political class and the show business personalities motivated by the desire for publicity. That desire is particularly manifest among the once-prominent, still uncomfortable with being remaindered after their sell-by date. The idealism, to the extent that it exists, is appreciated only by their fellow travelers. Those of a different denomination discount it as soon as they hear it. “If that’s a contradiction, then contradiction is fine. You can still call for the abandonment of nuclear energy regardless of how much energy you use. It’s the same if you work for nuclear power-related companies or government agencies. The question is whether the contamination from radioactivity that occurred at Fukushima will never happen again for all of eternity, or whether you will entrust the disposal of nuclear waste to the people of the future whom you don’t know, when the final disposal sites have yet to be determined. The question is an individual’s ethics, not their energy policy. “Opinions on any matter, and ethical matters in particular, should always be free, regardless of the consistency with one’s status, career background, standpoint, behavior, or history. That’s why criticism of the sort such as ‘How can Sakamoto Ryuichi talk about abandoning nuclear energy when he appeared in a commercial for electric cars?’, or ‘He used a lot of electricity in his technopop days’, only obscures the essence of the problem. This in a country where everyone is being asked to cut back by 10% on electricity usage this summer. Those familiar with the decades’ worth of “do as I say, not as I do” editorializing by the self-congratulatariat in the West will recognize Mr. Fujiwara as a member of the same tribe. “The claim that we will suffer even worse disasters if we don’t resume nuclear power generation transcends common sense. I question the belief that money solves all, but the sense that there is no happiness without growth is the true belief of the establishment in all economic superpowers. “Will we give priority to abandoning nuclear power over the economy, or vice-versa? Does success in the world depend on money, or not? The debate over the conditions of happiness will undoubtedly become the demand of history”. Chances are the student will someday grow up and answer his own questions, unlike the author of the piece, though both have pitched their tents for now on Straw Man Island. In the meantime, chances are neither one will be sweating indoors this summer. Here’s one reason the tone of the debate matters just as much as the content: The National Police Agency is now beefing up their defense of nuclear power plants and rethinking their anti-terrorist strategies, both for the plants themselves and the cooling facilities. They stationed personnel permanently at the plants shortly after 11 September 2001, and have had squads on 24-hour alert armed with submachine guns and sniper rifles since May 2002. The same sort of people who flew commercial airliners into office buildings have found in the restart of Japanese nuclear power plants the chance to restart their own mojo. Sakamoto Ryuichi was in New York when the 9/11 attacks occurred. More than the attacks themselves, the American response troubled him. He thought the terrorism was a natural consequence of American behavior. Extensive coverage was given to a report released last week that predicted perhaps 130 deaths would occur in the future from the Fukushima accident. Given less coverage was the fact that, assuming the number is correct, the total corresponds to 30 people per TWh generated. That’s much fewer than the 138 deaths per TWh that result from the electric power generated by fossil fuels, and not nearly as many as the almost 600 elderly people from Fukushima who have died, in part, due to the evacuations. But if the professionally or avocationally outraged people mentioned in this post care about that, it would only be to resume their call to end fossil fuel generation too. After all, it’s only electricity.